Many companies might get a few 1st page rankings, but are they Position 1, 2 or 3 or are they position 8, 9 or 10? And are they able to get multiple highly competitive keyword rankings? Not just 1 or 2 but dozens? At Legal Marketing Advantage can do just that and we have the results to prove it. Did you know there are SEO companies out there that will take on more than one competing client? Don't use the services of a company that splits its time between you and your competition. With LMA, you get exclusivity in your Geographic Market. The only client we'll take on in a given area is YOU. You've heard horror stories about SEO companies locking their clients in to 2 or 3 year contracts and then not producing results…ever. Why should you have to pay for a service that's not working? You shouldn't. That's why you're not locked in to long-term contracts with Legal Marketing Advantage. Lawyers have always been on the cutting edge of marketing: phone books, radio, T.V. and now the internet. If you're not expanding to include the internet you really need to do so and sooner than later. However if you're already on the internet, but not getting the results you want there are many reasons for this. We understand all aspects of online success and our results speak for themselves, unlike many SEO companies that just focus on getting you ranked higher. So if you want to put this to work for you and increase your number of leads from the internet give us a call today at 1-800-234-5998 to set up your free consultation. Get to the top of the search engines the natural way. Want to be at the top of the Search Engines today? PPC is the fastest way to get you there. User friendly designs focused on building relationships and getting you more leads. Building a website is not enough. Deploying a content creation strategy will help you get more leads. The online market for personal injury legal services is one of the most competitive spaces on the internet. 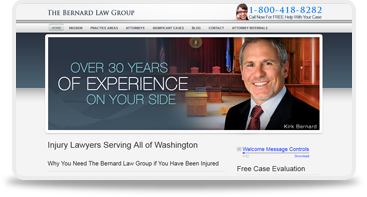 The Bernard Law Group had an established personal injury website and had been using another SEO company, but the few good rankings they had weren't above #5 on page one. That all changed when Legal Marketing Advantage stepped in to handle their online marketing efforts. Shortly after LMA came aboard their rankings started to increase and today the Bernard Law Group has numerous position 1-3 rankings and gets leads from their site daily.